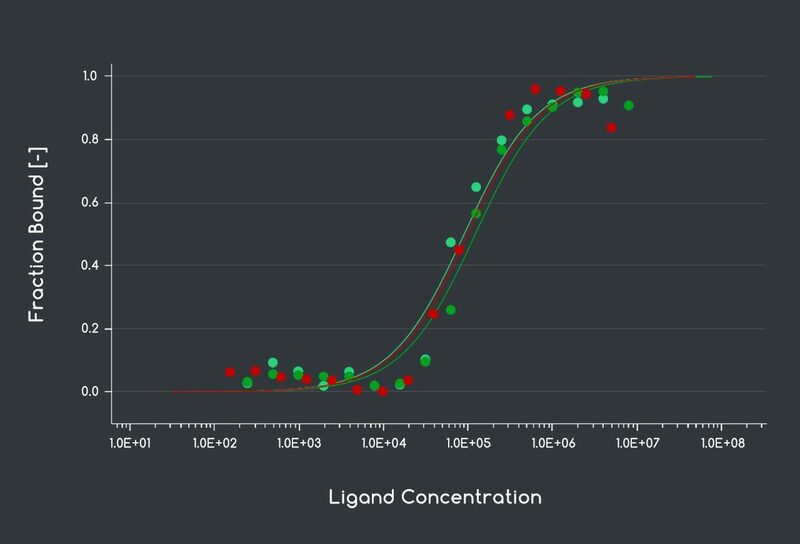 Dilution series are a common method in different scientific fields to generate standard curves for calibration of instruments or for the evaluation of the bioactive potential of diverse substances. Particularly, the determination of steady-state binding affinities is widely used in biochemistry and pharmacology for drug discovery processes. Here, serial dilution series are required to record dose-response curves and to calculate the steady-state affinity, e.g. in drug discovery studies. The example curves below show the readout of a MicroScale Thermophoresis (MST) binding assay performed by 2bind GmbH. In such an assay the binding affinity of a compound to a protein target is analyzed by testing a serial dilution of the compound. Manually generated data (red) are compared to the I-DOT One performance (light green: first run, dark green: second run). The binding affinity, determined by a curve-fit, agrees well between the experiment with the manual generated compound serial dilution and the two experiments with the I-DOT One generated compound serial dilution. 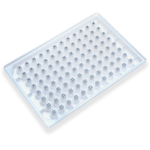 Traditionally, multichannel pipettes and pipetting robots prepare the required dilution series across a number of wells in microplates. This is done by transferring small amounts of high concentrated stock reagents (in DMSO or buffer) from one well to the next. This procedure is continued and finally results in a gradually lower reagent concentration. The most striking drawback of this traditional way is error propagation, which increases with each transferring step in the serial dilution due to deviations in pipetting accuracy and precision. Moreover, these methods often not allow for preparing microvolume dilution series in pure DMSO, which can be problematic for small molecule compounds. Using the I-DOT One non-contact dispenser, these limitations can be avoided. 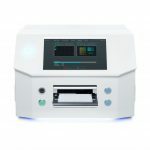 The technology allows for fast dispensing of low volumes, ranging from single digit nanoliters up to several microliters. Importantly, the method does not rely on traditional plastic pipette tips , thus enabling direct dilution. In contrast to serial dilution, direct dilution transfers different volumes of the same stock solution directly into successive wells to generate the required dilution series. Normalization with buffer or solvent can also be easily set up with the implemented software to adjust all wells to the same volume. With this non-contact direct dilution, less compound material is required, saving precious compound material and cutting consumable costs.